FoAM is building a story for Electrified III: The Responsive City in Ghent in September. It’s called Borrowed Scenery 1.0 and follows on from our previous Borrowed Scenery 0.1 in the same city in 2009. The story will be built out of parts arising and inspired from the groworld project – human plant interfaces, but with a focus on physical narratives and alternate realities based in the city. 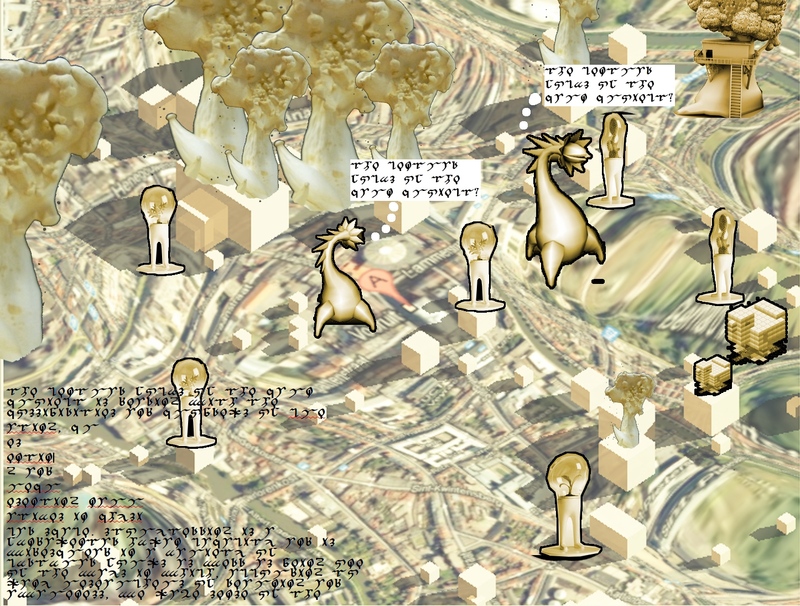 One of my tasks is to take two of our existing projects, Germination X and Boskoi and bring them together – absorbing the physical space of a city into an online game, as well as using a mobile foraging application as a way to propagate pieces of the overall story. This is a good chance to prototype some ideas for combining imaginary online spaces with physical spaces, online players from all over the world and people foraging in the streets of Ghent. Representing plants found by Boskoi foragers as characters – the bubble plants with feet are the plants from our world in the game’s reality. 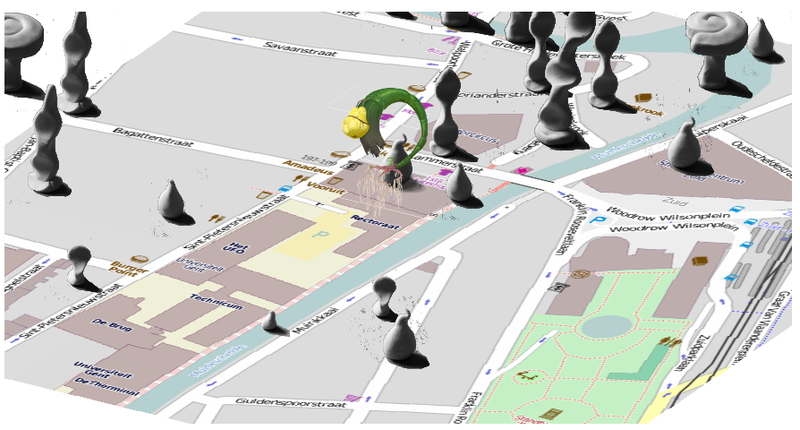 Using the map of the city as terrain – which becomes deformed by the activity of players. Mixing different styles, organic and digital elements – but focusing on sculptural and 3D objects (rather than Germination X’s mainly 2D look). Use of many more minor and major characters (e.g. the chicken in the lower left). Use of Lingua Ignota – the “unknown language” of Saint Hildegard of Bingen, who’s viriditas or ‘greenness’ is an important element of this story (the pope is also making her the 35th “Doctor of the Church” on the 7th October, while the festival is happening). Further ingredients will include the music of Stevie Wishart, plenty of patabotany and a good dose of tarot. 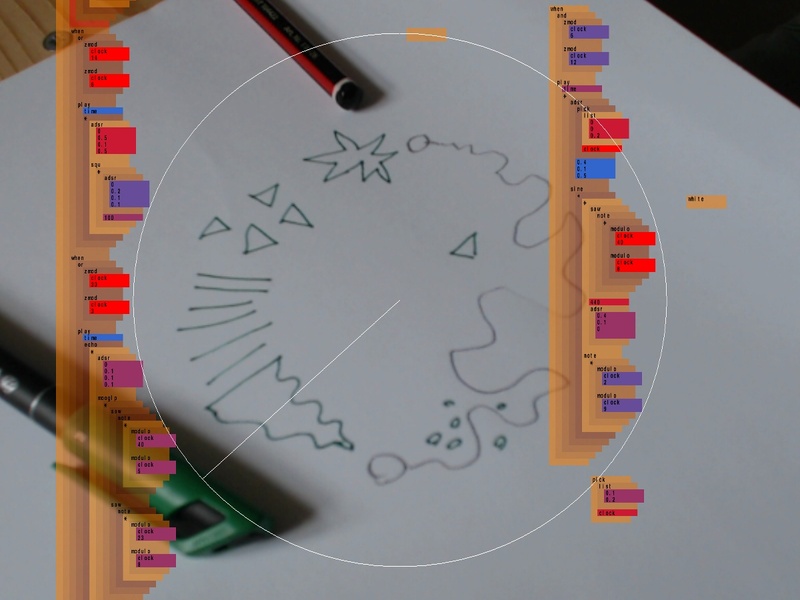 Live coding in cyclic time, while making the process of sketching, painting and general mark making as much part of the musical performance as the coding is. This is a prototype for “The Hair of the Horse”, a performance with Alex McLean and Hester Reeve as part of Live Notation at the Arnofini on Friday 27th July. It’s incomplete without Alex’s code over projected and I’m also expecting the performance will consist of a much larger and messier score! I think it’s possible to take these kinds of stats too seriously (especially in small sample sizes as here) but in combination with focus study feedback you can start to build up a useful picture that can be used to influence decisions.